Four years ago, U.S.-Pakistan ties hit bottom when President Barack Obama stood before the American public and announced the killing of al-Qaida leader Osama bin Laden during a covert U.S. raid in the garrison Pakistani city of Abbottabad. “It’s been well documented that there have been some peaks and troughs in the relationship between the United States and Pakistan,” White House Press Secretary Josh Earnest acknowledged Tuesday. As Obama prepares to welcome Pakistani Prime Minister Nawaz Sharif to the White House Thursday, Earnest said the president is looking to strengthen the relationship based on shared interests – namely countering extremists in the region. Despite the once-turbulent relations, the Wilson Center’s Michael Kugelman said the number one U.S. objective in Pakistan for years has remained constant – stability. “The U.S. simply worries about Pakistan being a very volatile country that is a haven for so many different types of militant groups, and also understanding that the Pakistani security establishment has very unsavory relationships with some of these groups. All of this [is] compounded with the fact that Pakistan has nuclear weapons,” Kugelman said. In that context, the U.S. welcomed Pakistan’s military offensive against the Pakistani Taliban and other al-Qaida-linked militants in the country’s North Waziristan tribal region in the summer of 2014. 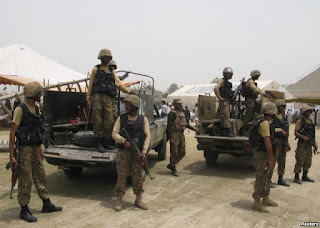 The ongoing, massive, counterinsurgency, army-led operation, dubbed Zarb-e-Azb, has since been expanded to other parts of the country and has killed more than 3,500 militants, while at least 400 soldiers also have died, military officials have said. Islamabad maintains the terrorist infrastructure in the Waziristan territory has largely been uprooted, leading to a significant decline in suicide bombings and other terrorist attacks in Pakistan. However, Afghan and U.S. officials insist the offensive merely flushed the militants across the border into Afghanistan, fueling the Taliban-led insurgency there. The Afghan conflict is also expected to be a focus of Thursday’s meeting between Obama and Sharif, which comes a week after the American president announced he was slowing the withdrawal of U.S. forces from Afghanistan, while keeping the training and counterterror mission unchanged. White House Press Secretary Earnest last week said Pakistan has a role to play, particularly in helping bring about a political settlement in Afghanistan. Sharif will inform Obama that Pakistan is determined to promote peace in Afghanistan but leaves it to the government there to decide whether they want Islamabad to play any role and use its limited influence with the Taliban to bring the insurgents back to the negotiating table, said Tariq Fatemi, special assistant to the Pakistani prime minister on foreign policy matters. “And if they (the Afghan government) believe that this peace process is not in their favor then whatever other option they want to exercise, they are welcome to exercise it," Fatemi said ahead of the talks in Washington. "They are a sovereign and independent country. Pakistan as a friendly neighbor with multiple linkages is ready to play any role that can help promote peace process in Afghanistan." 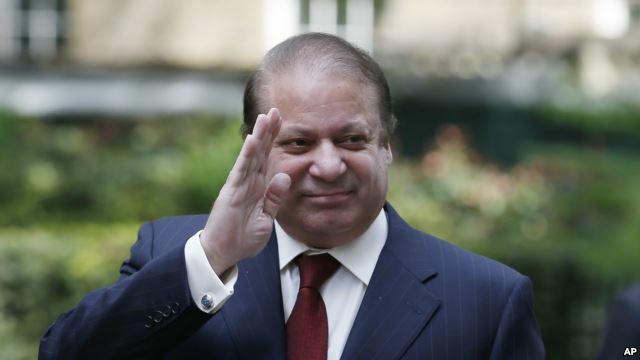 South Asia analyst Kugelman said he has low expectations for Sharif’s White House visit – dubbing it a courtesy call that the Pakistani prime minister is making at the invitation of Obama. The two leaders last met in the Oval Office in October of 2013. The Wilson Center senior associate noted the president’s attention is focused on deepening the U.S. relationship with Pakistan’s neighbor and archrival, India. 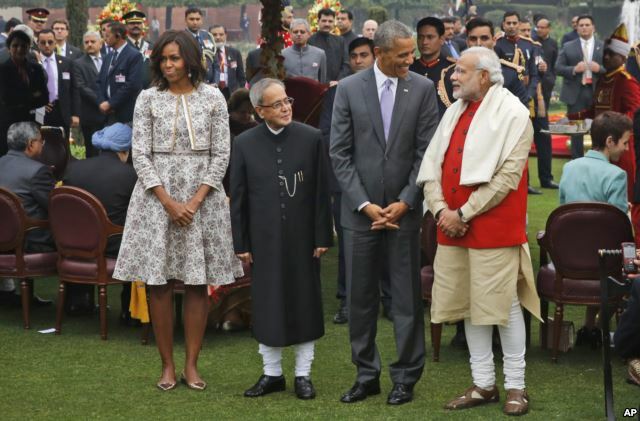 In January, Obama became the first sitting U.S. head of state to attend India’s Republic Day parade, a symbolic visit that included media reports of a budding friendship between the U.S. leader and Indian Prime Minister Narendra Modi. The two met again last month on the sidelines of the United Nations General Assembly, with Obama praising Modi’s efforts to fight climate change. An area where Pakistan would like to see parity with India, Kugelman said, is on how the United States views its nuclear program. The U.S. and India struck a landmark civilian nuclear deal in 2007. But he called a similar U.S. agreement with Pakistan wholly unlikely. Press Secretary Earnest recently downplayed media reports the U.S. is serious about reaching a civilian nuclear deal with Pakistan. Pakistani officials dismiss safety concerns regarding the country’s nuclear weapons program and have vehemently rejected reports of discussions with the U.S. on ways to limit Pakistan’s development of its nuclear arsenal, believed to be the world’s fastest growing. 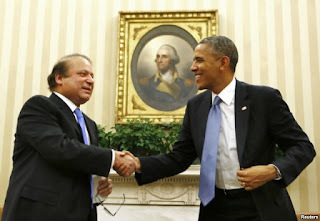 American newspapers reported just days before Sharif’s meeting with Obama that Washington is exploring ways to see whether Islamabad might agree to some curbs on its nuclear arsenal in return for paving the way for Pakistan to enter into the 48-nation Nuclear Suppliers Group (NSG), which controls the export and transfer of nuclear materials. “Our nuclear weapons are not the weapons of war. They are the weapons that are meant to discourage conflict and war from taking place,” Fatemi said. He reiterated that Pakistan’s nuclear program is India-specific and hence it will not accept any curbs on it because that would amount to comprising on national security interests. 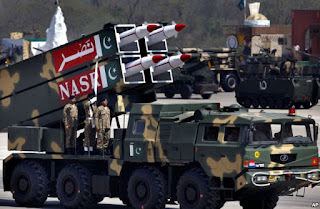 Deployment of Pakistan’s short-range, nuclear-capable missile called "Nasr" is of primary concern to U.S. policymakers. 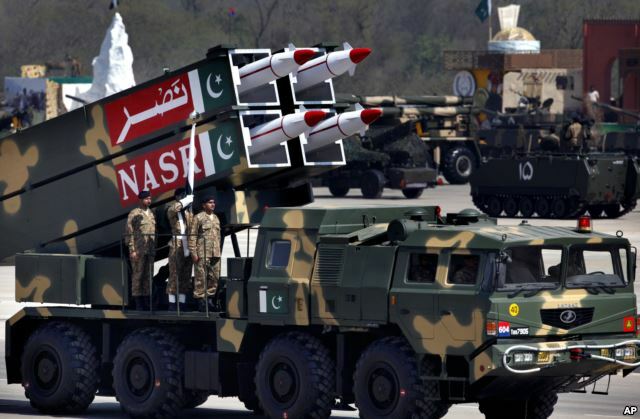 Pakistani officials maintain that their plan to deploy the missile with a range of 60 kilometers is designed to discourage rival India from imposing a surprise limited conventional war on the country under New Delhi’s alleged “Cold Start” doctrine. “Their tendency to fight or their doctrine to fight a preemptive limited conventional war against Pakistan is an issue. And that is why Pakistan has tried to plug that conventional level of operational threat by showing the capability in shape of ‘Nasr’ that we have a technology and you have to factor it in your calculus if you contemplate such a doctrine,” said Zahir Haider Kazmi, a senior official at Pakistan’s nuclear arsenal program named Strategic Plans Division. Pakistan's tensions with India have increased in recent months with each side accusing the other of indulging in "unprovoked" cross-border fire, while a wide-ranging official dialogue aimed at normalizing ties remains suspended. Those fears have intensified in the wake of development of Pakistan’s short-range missiles and their possible deployment, because critics believe "the intermingling of conventional forces and nuclear weapons in a battlefield theater" makes a nuclear war more likely.